Celebs SING YOUR FACE OFF Alter Egos Revealed - EXCLUSIVE! For people who ever wanted a new kind of singing competition show that mixes “The X Factor” with “Dancing with the Stars”, ABC has the show for you! 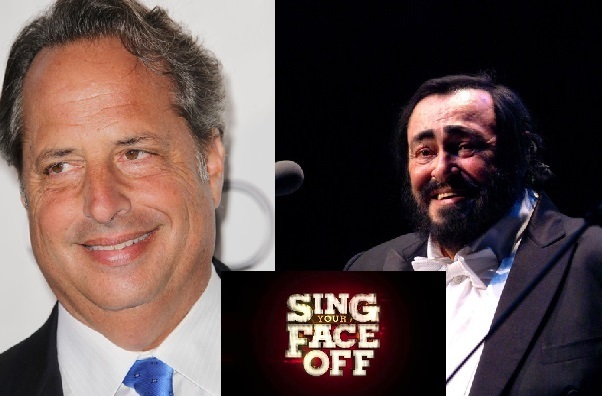 It’s called “Sing Your Face Off”, where celebrities have to sing incognito as another celebrity – the one that made whatever song that they’re singing famous. Hosted by an actual Scottish-American singer and actor, John Barrowman from “Dr. Who” has quite the fan base. His fans cheered for him in the audience. Pictured (l-r): Lisa Rinna as Britney Spears, and host John Barrowman.. The show seats a panel of three judges who score their fellow celebrities on a scale from 1 to 10, very much like the scoring system of “Dancing with the Stars”. However, they do not hold-up score cards, instead, their scores are displayed on a huge monitor screen. The judges are: 1980’s Pop icon Debbie Gibson, Saturday Night Live comedian, Darrell Hammond, and “Drag Race” and “Drag U” producer and host RuPaul. Some examples of some of the scores given were: 7, 9, 8, 10. The scoring system is tracked by the five contestant celebrities ranking on an overall leader board much like the technique used on “The X Factor.” The celebrity contestants remain the same each week in which they must disguise themselves as a different Pop Culture singer. The celebrity contestants are: comedian and actor Jon Lovitz, “Skid Row”s Sebastian, China-Anne McClain from Disney show “A.N.T. Farm”, actress Lisa Rinna, and basket ball player Landry Fields. 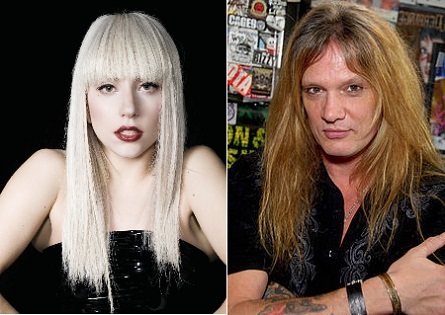 Voice lessons are given to these celebrities by voice coach Roger Love who trains them to sing in a way to mimic their voice as closely as possible to the real singer of the tune. Some of the singer challenges the contestants were given were Elton John whom Lovtiz had to portray along with a very unforgettable and comical Luciano Pavarotti; Adam Levine and Lady Gaga were the singers that Sebastian had to play; China-Anne McClain had to be Rihanna and Tina Turner; Lisa Rinna was Dolly Parton and an older version of a young Britney Spears; Landry Fields had to nail Lionel Richie and Pitbull. 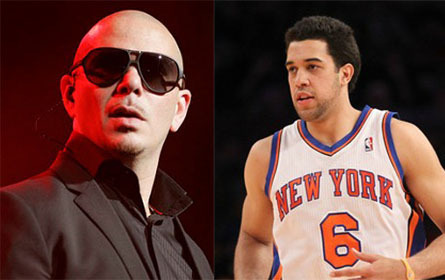 Pictured (l-r): Pitbull, Landry Fields. Along with singing, the contestants also had to be trained dance moves taught to them by renowned choreographers from “So You Think You Can Dance” popularity Napoleon & Tabitha D’umo (a.k.a. Nappytabs). Some celebrities made a good mockery of their singer alter-egos, ie: Sebastian’s version of Lady Gaga’s “Bad Romance” had a zombie-like quality, and Lisa Rinna’s Britney Spears “Hit Me Baby One More Time” was a vision of an old lady trying to imitate a teenager. Her younger twenty-something-year-old back-up dancers stole the show. At the end of each celebrity’s’ performances, and after the judges’ votes, the scores are re-totaled and the rankings are displayed on the leader board. Jon Lovitz was one of the celebrities who did quite well and scored on the high end. China-Anne impressed the judges with her Tina Turner “Proud Mary.” Sebastian was visibly uncomfortable in his patent leather Lady Gaga get-up and appeared to do a failed drag attempt. RuPaul told him “don’t be a drag, be a Queen.” And told him he needed to sissy-up his walk. RuPaul showed him how it’s done by shante, shante sashay down the runway. Barrowman said to “keep it going”, then he walked the runway. The other contestants also followed. The leader board is shown again for the new totals. Then the scores from the previous week are added-up to the current week’s scores to give the grand total for each contestant. In the last segment, a huge “Price is Right” style wheel is rolled out onto the stage. Barrowman said this is how the show “reveals” who the contestants get to be for next week’s show. The contestants have to spin this wheel that displays famous singers faces and whomever face it lands on is who they have to imitate in the next episode of the show. During John Lovitz’s try, the wheel first landed on Macy Gray. Then the producers stepped-in and said it landed on the wrong singer. Lovitz had to spin again. This time the wheel revealed who he really has to portray – Billy Idol. China was over-heard asking, “who is Billy Idol?” China got Michael Jackson, Lisa Rinna – Katy Perry, Landry Fields got Enrique Iglesias, Sebastian got Willie Nelson.